In a move designed to give its customers even more flexibility, BSkyB’s Sky+ personal video recorder is launching a brand new Catch Up TV service, offering more personal storage and new ways for customers to interact with their favourite TV shows. 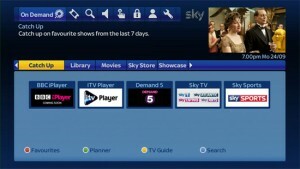 Sky says the wave of new features marks the latest stage in the ongoing development of Sky+, which is now enjoyed in over nine million homes, which it notes is more than all of the other competing pay-TV services added together. In August alone, Sky+ generated more than 1.2 billion sessions of time-shifted viewing as customers took control of their own TV schedule. Available immediately, Sky+ is giving customers even more flexibility by adding a new seven-day Catch Up TV section to its On Demand service. Customers will be able to keep up to date with their favourite Sky shows and also get programmes from ITV Player and Demand 5. With BBC iPlayer coming this autumn and 4oD arriving in early 2013, the Catch Up service will keep getting better, with programmes from the most popular free-to-air and pay channels all seamlessly integrated into the Sky+ experience. Sky’s On Demand service also includes access to box sets such as Mad Men, An Idiot Abroad and Mad Dogs available at no extra charge to Sky customers. A further initiative will allow Sky customers increased storage, with the launch this week of a new Sky+HD 2TB box. In response to customer demand for extra space to store their favourite TV shows, the Sky+HD 2TB box provides six times the storage of a regular Sky+HD box. Meanwhile, away from the main TV screen, Sky+ customers will also be able to start using the new Sky+ app for iPad that lets them connect to online communities around virtually every show on TV, across Sky and other channels. Through the app, which goes live this week, Sky customers can interact more fully with content than ever before, following and contributing to online chat via an in-built Twitter feed, plus gain easy access to a range of extra information related to the show they are watching.